The only way for vicar's daughter Phoebe Millbury to inherit a family fortune is to find herself a duke-just as her late grandfather demanded in his will. But Phoebe, who's still trying to make good after a romantic scandal, also has her two cousins to contend with. They're all competing for the same money, maybe even the same men . . . until Phoebe meets her match in the terribly handsome and charming Rafe Marbrook. 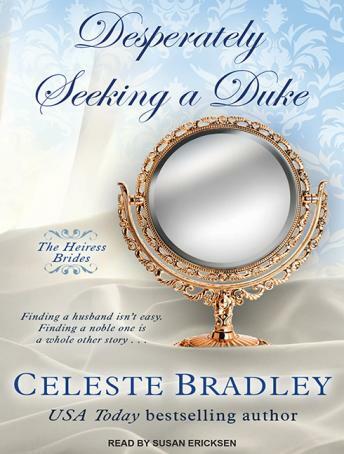 When she receives a marriage proposal from the Marquis of Brookhaven, Phoebe is thrilled to learn that Rafe is headed for dukedom, and accepts his offer. There's only one problem: It's from Rafe's older, less captivating brother, Calder. Now Phoebe finds herself on the verge of yet another scandal as she faces a desperate choice: Marry Calder for his money-or follow her own heart? Each way can only lead to trouble.